Brazil: Júlio César, Alves, Thiago Silva, David Luiz, Marcelo, Luiz Gustavo, Fernandinho (Ramires, min 72), Hulk, Oscar (Willian, min 105), Neymar Jr and Fred (Jo, min 63). Chile: Bravo, Mena, Silva, Medel (Rojas, min 108), Jara, Isla, Aránguiz, Díaz, Vidal (Pinilla, 87), Alexis and Vargas (Gutiérrez, min 56). Goals: 1-0 David Luiz, min 18; 1-1 Alexis, min 32; (1-0 David Luiz; 2-0 Marcelo; 2-1 Aránguiz; 2-2 Díaz; 3-2 Neymar Jr). The World Cup hosts have advanced to the quarterfinals of the competition after a thrilling match against Chile in the Round of 16. 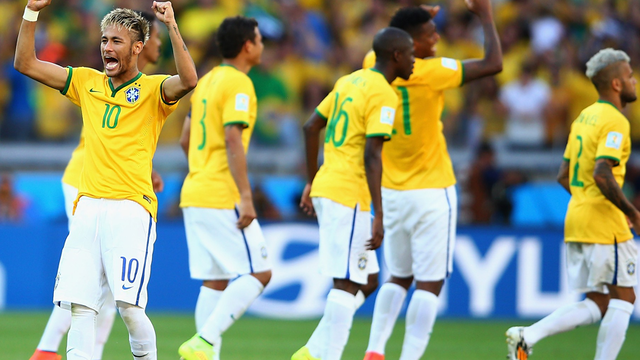 The Brazilians, with Dani Alves and Neymar Jr, downed their South American counterparts in a penalty shootout. Alexis and Barvo’s Chile put in a terrific performance, and nearly eliminated the hosts in extra time but the late attempt crashed against the crossbar. Brazil took the initiative of the game from the starting whistle. Scolari’s men moved the ball quickly and put plenty of pressure on Barça’s new keeper, Claudio Bravo. Marcelo threatened with a long-range shot, and on 18 minutes Brazil took the lead. Neymar Jr, who was very active in the first half, took a corner kick which was headed on by Thiago Silva into the path of David Luiz, who knocked the ball into the back of the net. Despite Brazil’s superiority, Chile threatened to level on the counter. Alexis and Vargas both enjoyed chances, and just after the half-hour mark, Chile scored the equaliser. A sloppy error on defence from the Brazilians saw the ball fall to Alexis alone in the area. The FC Barcelona forward slotted the ball into the side netting of Julio Cesar’s goal. The teams went to the break with 1-1 on the scoreboard. In the second half Chile were more aggressive.The ball rarely left Brazil’s half of the pitch for most of the half, and Julio Cesar was called on to make a fantastic save to keep his team in the competition. Hulk scored but his goal was called back for handling the ball. Scolari’s men surged forward in the dying minutes of the match, but Bravo did well to avert the danger. With the 1-1 deadlock on the scoreboard, the first half of extra time saw the Chileans dig in on defence and cede the initiative to the host team. There weren’t many goalscoring chances, but Bravo dealt well with the ones that did reach his goal. In the second half of extra time, Pinilla nearly scored the winner but the ball crashed against the crossbar. From the 11-meter mark, Julio Cesar saved two shots and Neymar Jr, Brazil’s fifth shooter, scored to put his team ahead. On the Chilean side, Alexis missed his penalty and Bravo saved Hulk’s shot, but in the end Jara’s shot hit the woodwork and sent Brazil to the quarterfinals.